*Collect replacement repainted bonnet and fit - sell old one. 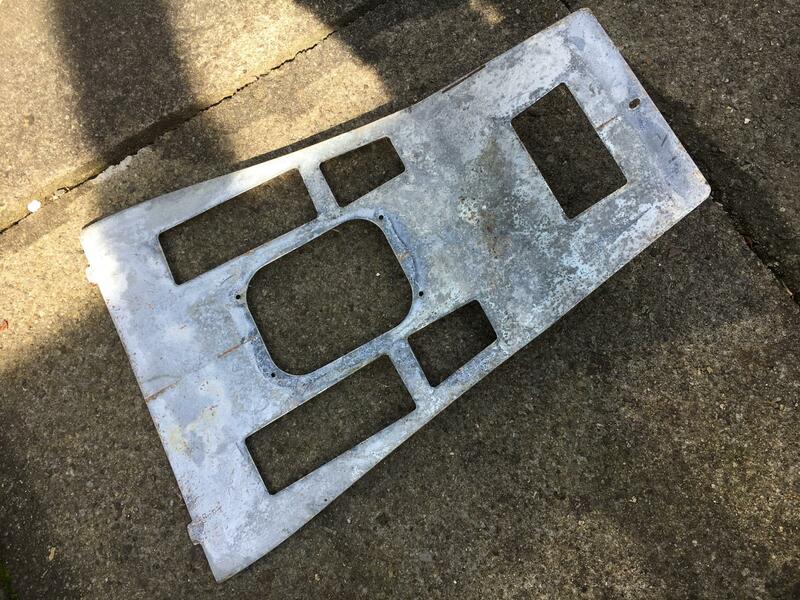 *Get the dodgy areas of the car painted, this included the front valance, roof, rear flanks and sills (some of this might be ok with a rattle can, i.e. the bits low down). *Fit new bonnet gas struts. *Full service and coolant change. *Rub down interior floors (after making sure there are no further leaks), lay down some zinc primer and paint on top of that. *Repaint X300 Sport wheels and replace the Azevs. Azevs can go on sale. *Change steering wheel for the correct one. *Fix operation of handbrake. It works, but the button on the lever is stuck. *Find a suitable battery that is not calcium or too big. About 55Ah is the limit, silly Jag. 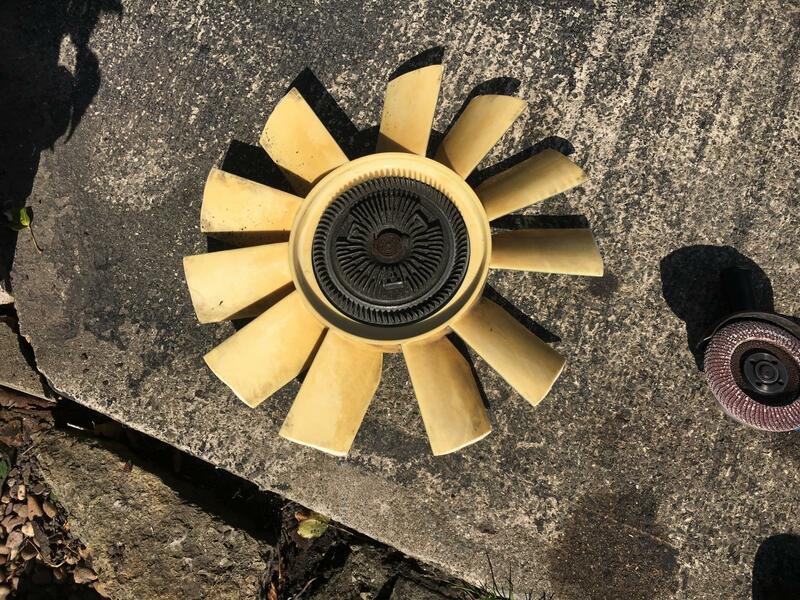 *Investigate engine fan catching on shroud. I fear it is the gearbox mount. Now that is a long list, but a great many of the items are quite doable and not very involved. My main headaches are paint and probably that gearbox mount. With all those bits done though, it will be a totally different car, which is quite an exciting idea. I was looking through the paperwork with the car. There is a receipt from 2017 for £2173! This included 31 hours labour! 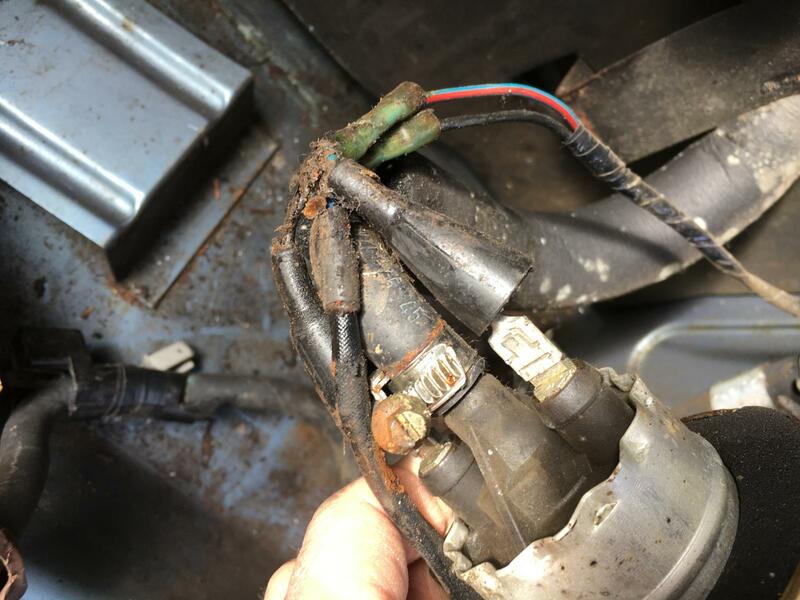 Description of the work is welding, repairs to washer pump and replace rear mounts. My theory is that the owner at that point lost his cool after paying the bill and attacked the big cat with blackboard paint. I managed to get the centre caps on the Azev wheels off today so that gave me the opportunity to test fit the X300 Sport wheels (i.e. XJR6 wheels). I noted the Azevs were on with spacers. I don't like that. 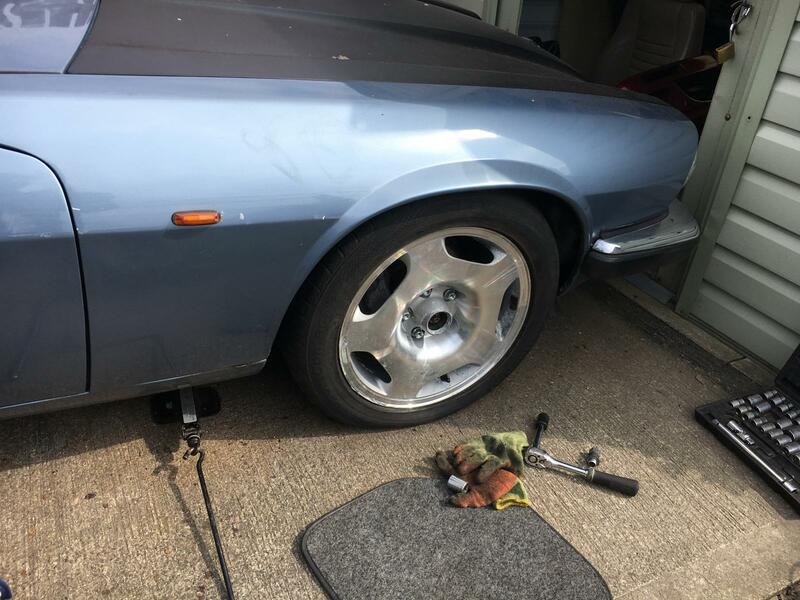 Also the wheel nuts are different so going back to proper Jag wheels means I need another set of wheel nuts annoyingly. Anyway the XJR wheels fit without rubbing. Result. I'll paint those up soonish. Front brakes and suspension are all basically ok. No nasty rust surprised. Very even wear on brakes and zero play in the hub. I like the 4 pot brake calipers. I noted the exhaust is clearly a more recent replacement and there are no catalytic converters to worry about. A little more investigation into the engine fan, as I think it sometimes hits the shroud causing a random graunching noise. The fan tips look like someone cut them down so perhaps it is just any old fan someone found and stuck on there, and that's the problem as it's just wrong. An electric fan setup would be a much better way forward. I have to comment on how wonderful this is. I think this is (controversially) my favourite British car to look at. Thank you! I did a bit more fettling yesterday and had to put the Azev wheels back on for now so that it can be driven. The bonnet was removed and test fitted in the Range Rover to give me a clue whether I can pick up the replacement without going in the XJS. It might fit with the rear seats removed completely. 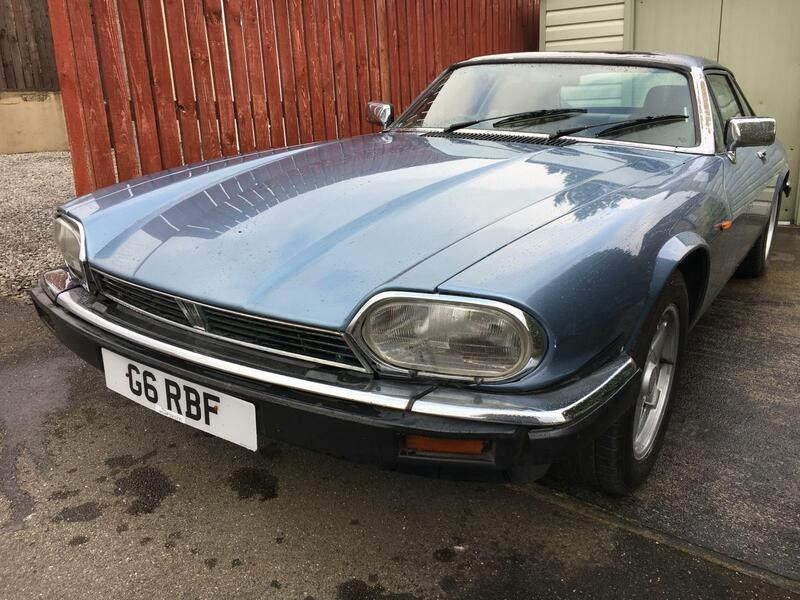 By the way, bonnet removal/refitting is very easy on the XJS because you can just rest the bonnet in place and the hinges are accessed from the front grille area. The broken reverse lights were just down to broken bulbs. The bullet bulbs were a sort of oversized bullet type I’ve never seen. No-idea where to get them but I had this idea to use the end caps off the old bulbs to extend the replacements, which made them large enough to fit. Worked fine. A quick clean in the rear light clusters revealed another broken bulb and the fact that Jag painted the “reflective” area in the rear lights matt silver for some reason. I still get an intermittent bulb failure light, mostly when pressing the brake pedal. 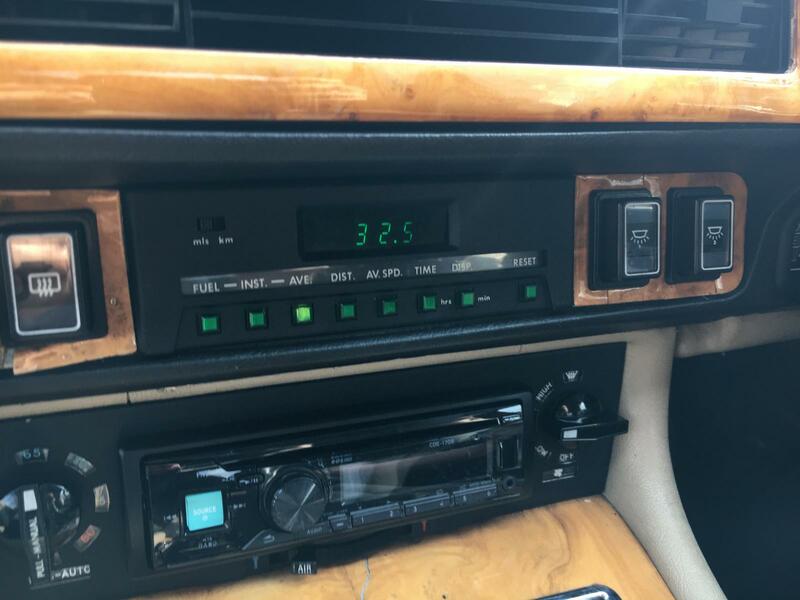 Dash lights still broken. Fuse ok so it might be the rheostat. The handbrake is being strange. The warning light is stuck on and I have discovered that the ratchet mechanism isn’t working at the moment. The handbrake works if you hold the lever up but does not lock in place as it should. The I cleaned enough much off the think to make it usable enough for spin at the end of the day. It’s really very different from any other Jag I’ve driven. Very quick and feels very alive at the moment what with the stripped out interior. It’s like an enormous sports car. Pretty grippy and surprisingly sorted front end, definitely sharper than the XK8, the only thing I can compare it to. It gains speed alarmingly rapidly and revs freely. The exhaust might not be standard. Must do a video, it is quite entertaining as it it right now. Also flashing fuel fail on the trip computer but not hindering progress. I’m replacing the fuel pump and filter anyway. The 3.6 is a lovely unit. Got a passing complement on the Jag from a neighbour. She said it was her favourite model as a child and it made her smile seeing it, which is nice. 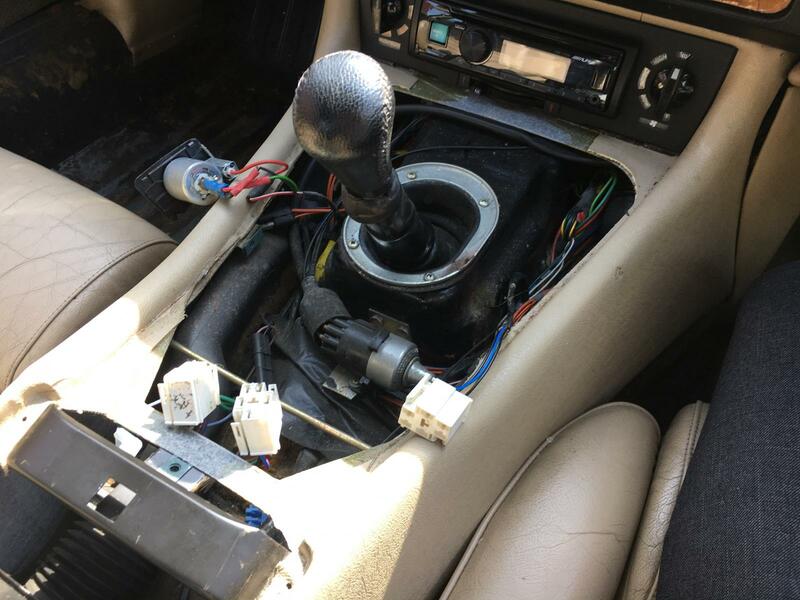 The XJ-S has a fly-off handbrake. 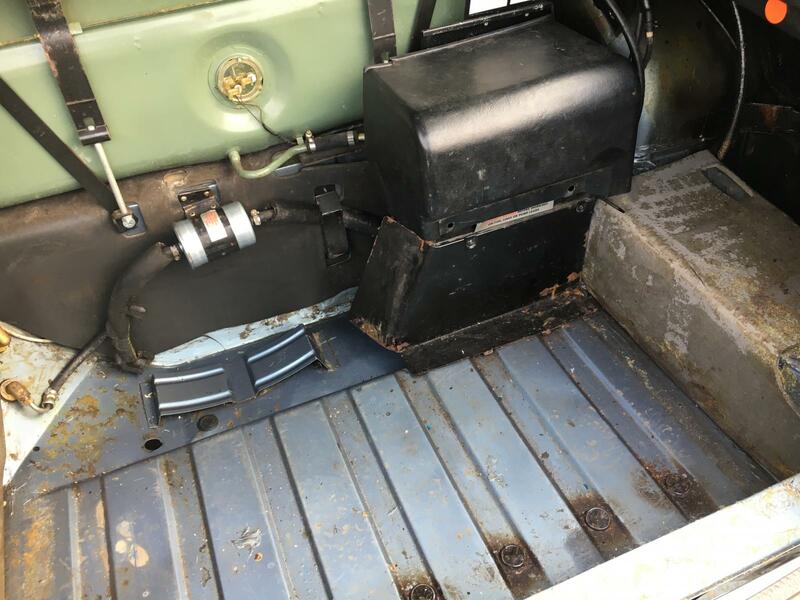 I’m familiar with the fly-off handbrake thing from the XK8. It is partially broken on this car though, yes I know it is meant to flop back down the to floor. It should ratchet the cable up when you engage it, then pull up and press the button to release. The little ratchet bit appears to be at fault here. A few important bits completed today. 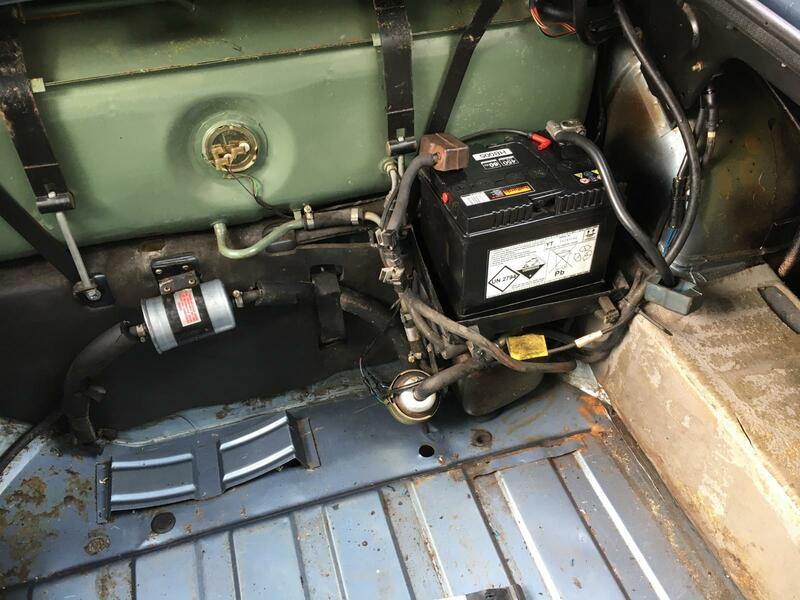 New fuel pump, fuel filter and battery fitted. Access is excellent what with everything being in the boot. I opted for a universal fuel pump, which was pretty much identical to the Lucas pump in it's dimensions. The only difference was the power goes to screw on post instead of spade connectors. I tidied up the wiring a bit and fitted new connectors. In between finishing the job due to running out of crimp connectors I went to UPullit and scored a good lead-acid (none of the calcium nonsense) for £20. It fits well. I was then able to reinstate the retaining clamp and battery cover. With the area tidied up a bit the car soon started up after priming the system with ignition on/off a couple of times. No leaks and the engine is running very well. It is even more alarmingly fast now. Feels faster than the 4.0 for some reason. Stick it in third, floor it and it will just zoom off. 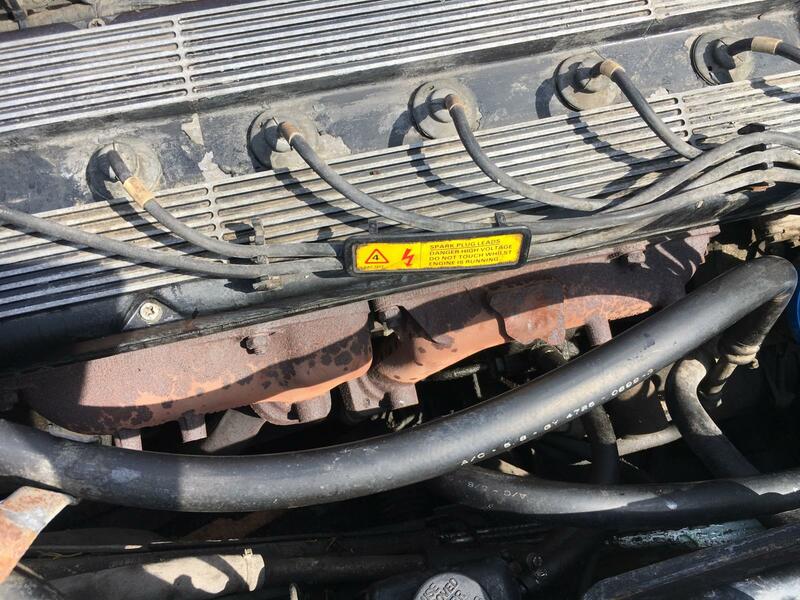 The alternator belt is on it's last legs and need replacing immediately. Replacement bonnet still not ready. Trial fitted the existing one in the Range Rover, it doesn't fit annoyingly. Was nice to have a nose about this today, a very handsome car is lurking under that satin black paint. Is that solent blue? there arent many cars as recent as these that truly benefit form a coach line, and look odd without..
It’s arctic blue, the same as an XJ40 I had last year. 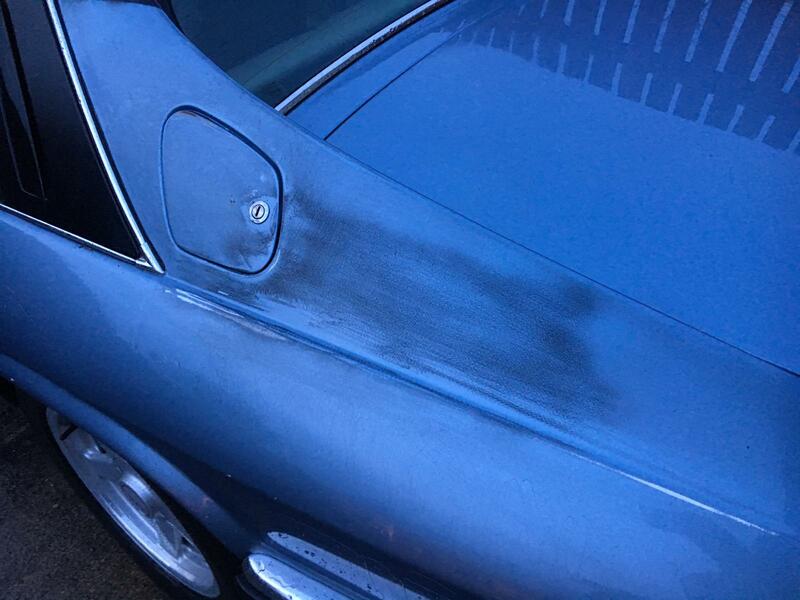 The mad thing is that if the someone hadn’t attacked it with the blackboard paint and an orbital sander, it would have probably been ok. I’m sure the coach lines looked nice on it. Some more progress. Today I changed the drive belt. To do this you must first remove the bonnet (dead easy, remove front grille, then undo four bolts and the gas struts). Next remove the drive belt for the air con. There are a couple of pivot points (10 mm bolts), then undo the locking nuts which provide adjustment for the tension. A good soaking with WD40 meant that everything came undone easily. 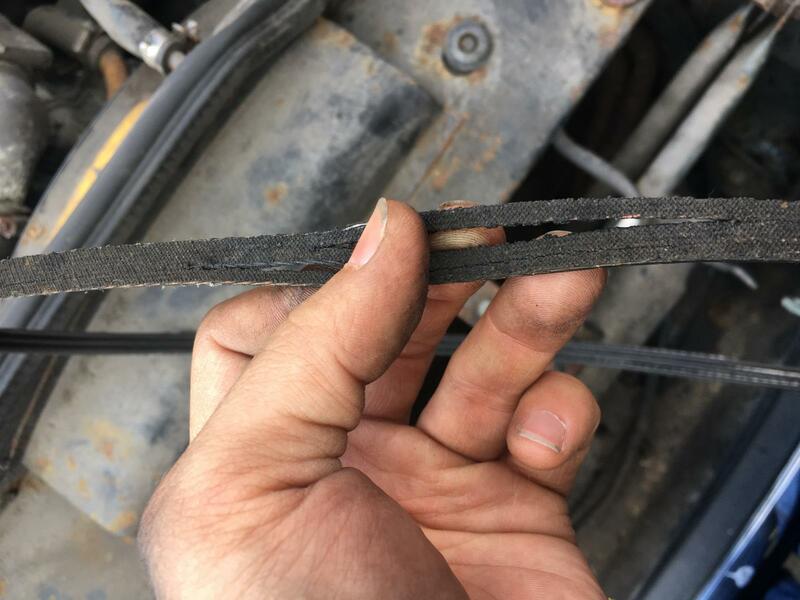 Finally the main drive belt (crank, water pump, alternator) is slackened as per the AC belt with the locking nuts and pivot points. The belt is then maneuvered around the fan out. The old belt is probably the worst one I have ever seen. One entire ply has gone and the rest of the belt just pulled apart in my hands. How it didn't snap is beyond me. With the belts off I started the car and drove it very quickly up and down a hill. This was to help diagnose the cause of the odd grauching noise I randomly hear when accelerating. With the belts off there was no such noise. 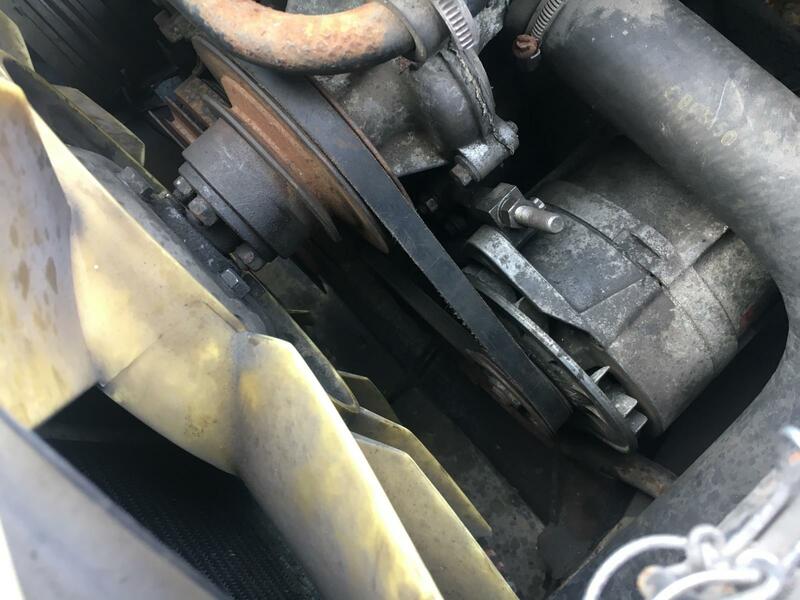 I'm pretty sure that when the engine flexes on the mounts (easy to see driving sans bonnet) the fan is hitting something or the fan itself is faulty as it has been cut down. Maybe it's off a V12, who knows. Anyway I'm minded to fit an electric fan. 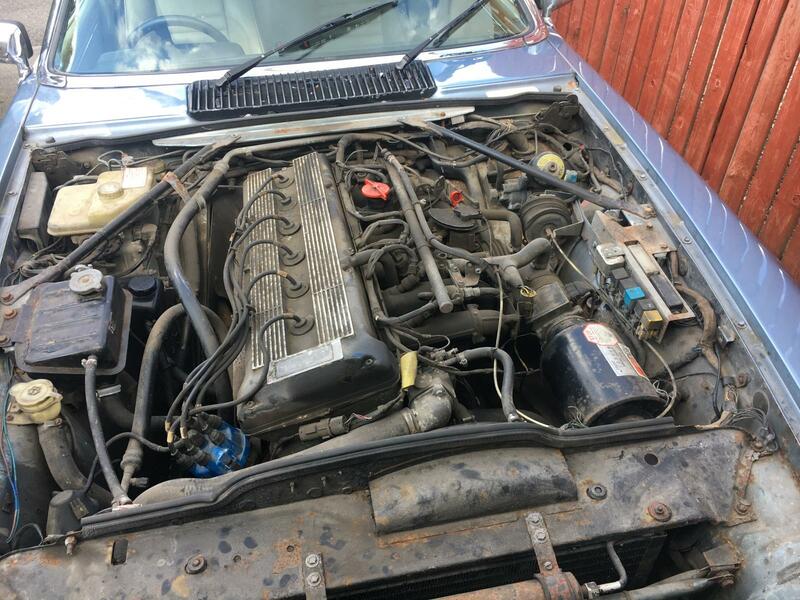 The new bonnet hasn't been collected yet, but since vans seem expensive to rent at the moment and the Range Rover won't swallow it, I might as well drive to Bolton and back in the XJS. The two main mechanical things to sort out were the fuel pump and the fan belt. It drives fine and is frugal enough so might as well. By the way the fuel light has come on for the first time since buying the car. Admittedly it hasn't done many miles yet, but it did over 90 miles on collection and there has been a lot of bumbling about in it recently. It might be the least thirsty Jag I have driven so far. Nearly all the remaining work on the car now is cosmetic and minor* electrical fettling. In terms of mechanicals all that is left is a damn good service and sorting out that fan. 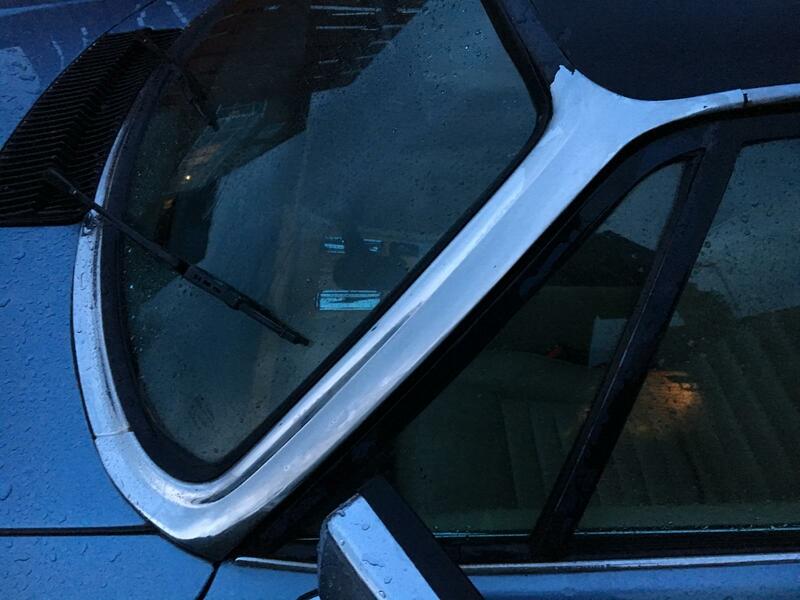 Things continued today with investigations into the non-operational passenger side window, the barely working driver's side window, non-operational electric mirrors and the non-operational central locking. To kick things off the driver's side door card was removed. Nothing too scary behind it all. The wires for the electric mirrors were all unplugged. 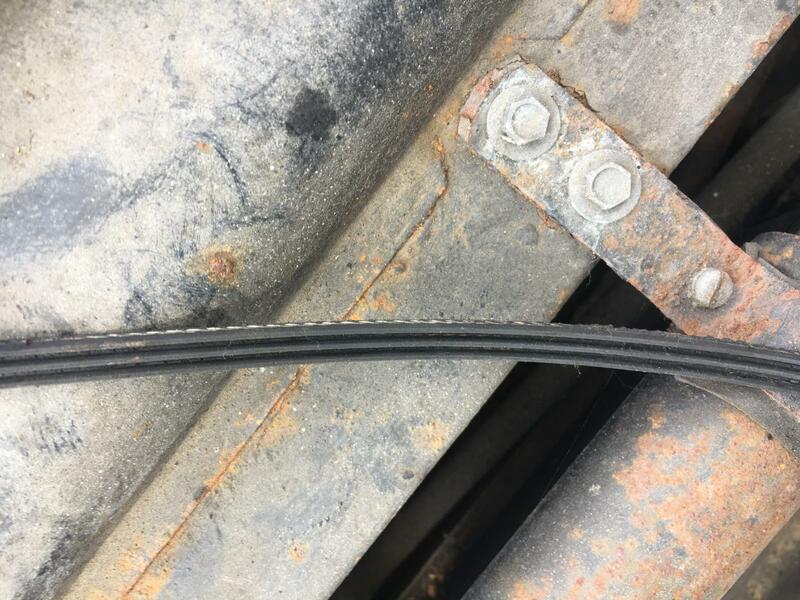 They are a particularly dinky bullet style connector and there are a great bundle of them. The driver's side window mechanism just needed lubricating. It works great now. The passenger side window also works perfectly, the problem is the switch, which is pretty good news. The mirrors and central locking are on fuse 8, a 7.5 amp fuse apparently. This was missing. I put in a 5 amp fuse for testing purposes as I don't have any 7.5s. Anyways with the wires for the mirrors plugged in the passenger side mirror moves up and down only. I'm wondering about those dinky connectors, they might need fettling with more to get things going. Happily at this point I discovered the central locking works. 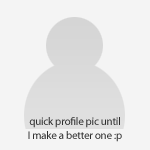 Nice. 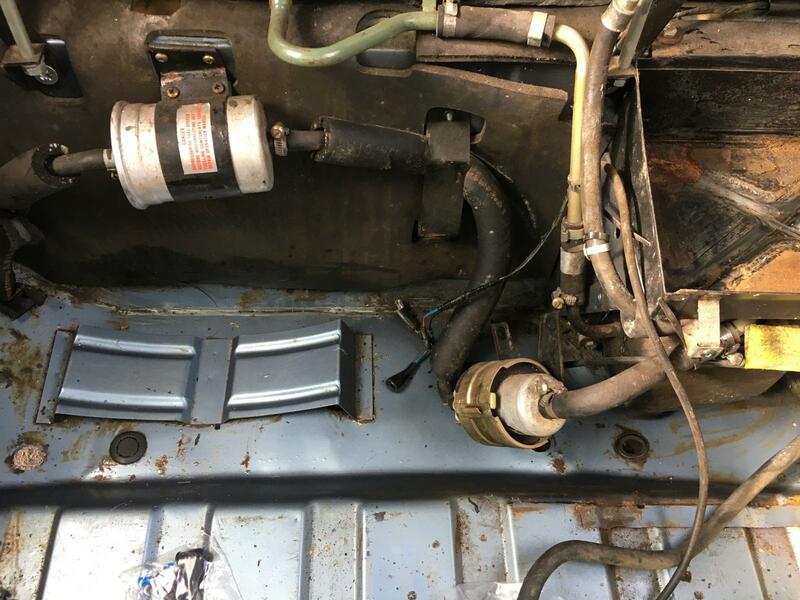 The extremely grubby petrol filler cap area was cleaned up and the lock lubricated. 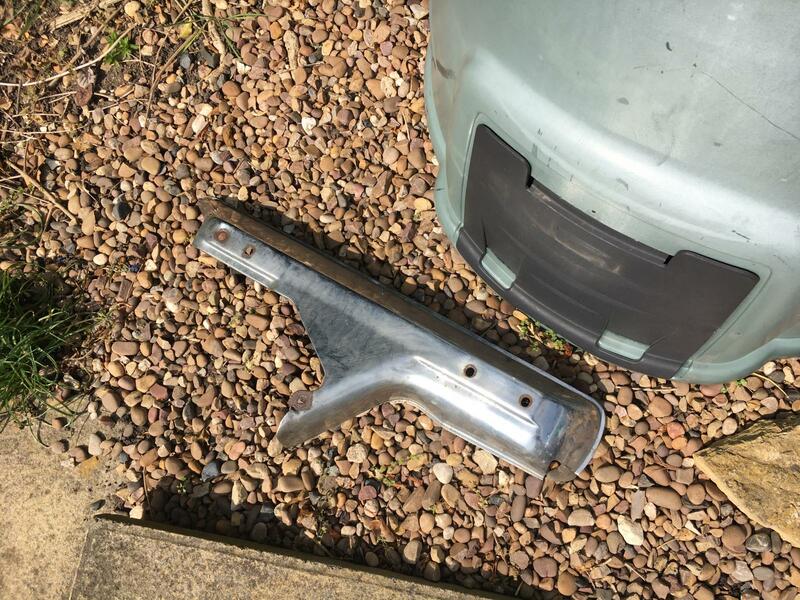 Then I had a go stripping some paint off the chrome. It comes off gradually with purple meths. Some of the black paint on the roof flaked off while I was at this. It looks completely intact underneath. It would probably take forever and an age to try and get so much paint off with meths. Does anyone know whether I can used fine wet and dry sand paper to try and skim a layer of paint off? It would be interesting to try this. If you want to give fine wet 'n'dry a go, I would use it wet with plenty of soap. It will depend upon the condition of the lacquer underneath the paint as to whether or not you can get away with it. Any dulling of the lacquer can most likely be poished out with a cutting compound and t-cut. Today about 200 miles was covered in the XJS in order to collect a freshly painted bonnet. Thoughts after the long drive. A nice firm and supple ride. Brakes, engine, gearbox and steering excellent. It feels very planted which is a surprise for something so old. Next surprise is the fuel economy. It blasted past 30 MPG on the computer and eventually settled at 32.5 MPG. Its is the most frugal old Jag I have driven. Once at Bolton the new bonnet was soon fitted and I also got some wheel nuts and a window switch. This means the XJR6 wheels can go on as soon as they are painted. The new bonnet makes the car look much, much better. The project is really gaining pace now. I'll soon be looking for a new challenge, nudge, nudge, wink, wink. 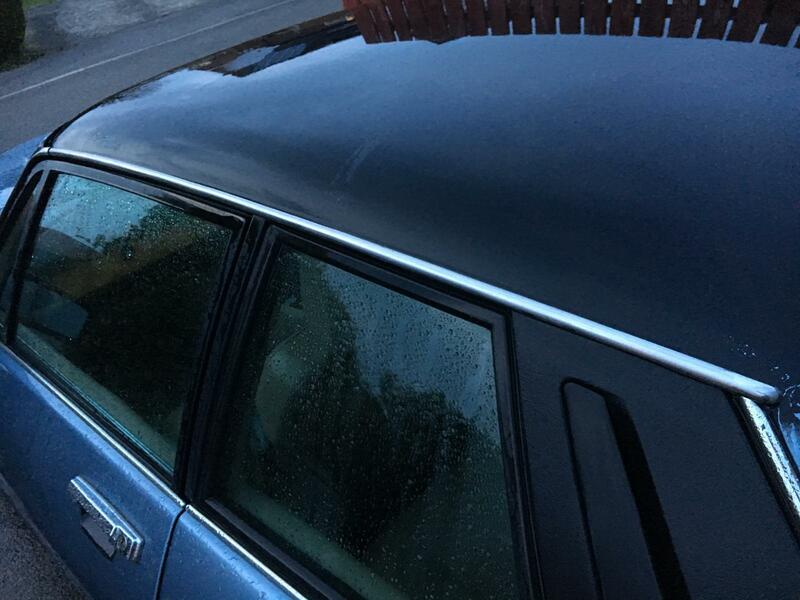 There’s a temptation to do the roof in vinyl because it would be an easy fix to the problem. Some fine grit wet and dry and sand papers arrived in the post today and with the light fading after dinner I had a little go with a spray bottle of soapy water and some 3000 grit wet and dry. 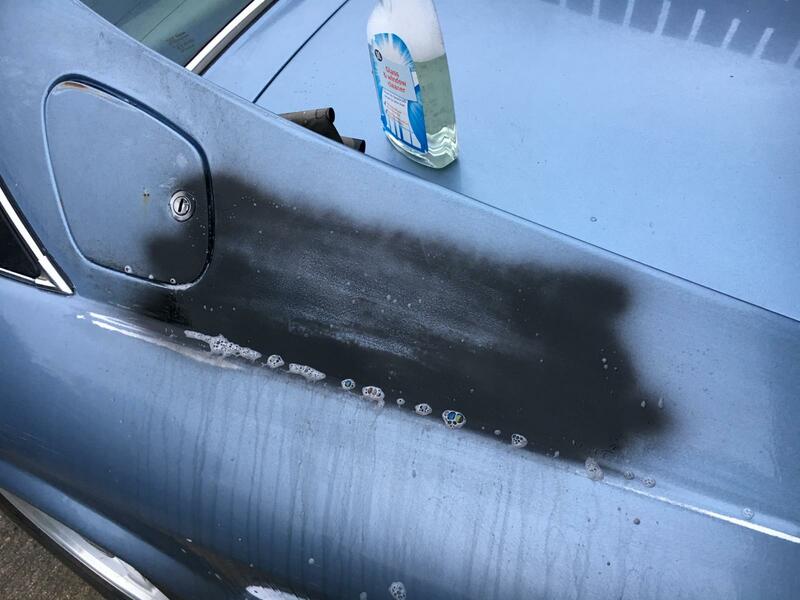 The paint just flakes off the chrome, areas of overspray are easily removed rather like a magic eraser and the outline of the old pinstripe was easily dispensed with within a few minutes. Even the stubborn parcel tape remnants came off the A-pillar. Very promising. I should get a machine polisher. Sterling work sir - I've been following this thread with interest. Oh - and I'll have a random please! An excellent thread! I do love XJSs they look amazing! Very much enjoying the revival of this one. That new bonnet looks great! Improves the front end hugely. Clean up of the satin black nonsense shows promise too, just clear lacquer over the top of the thin paint once done and claim it's patina instead of forking out for a partial respray and jobs a goodun. It was really important to get the bonnet done properly given it’s so big and draws your eyes in. 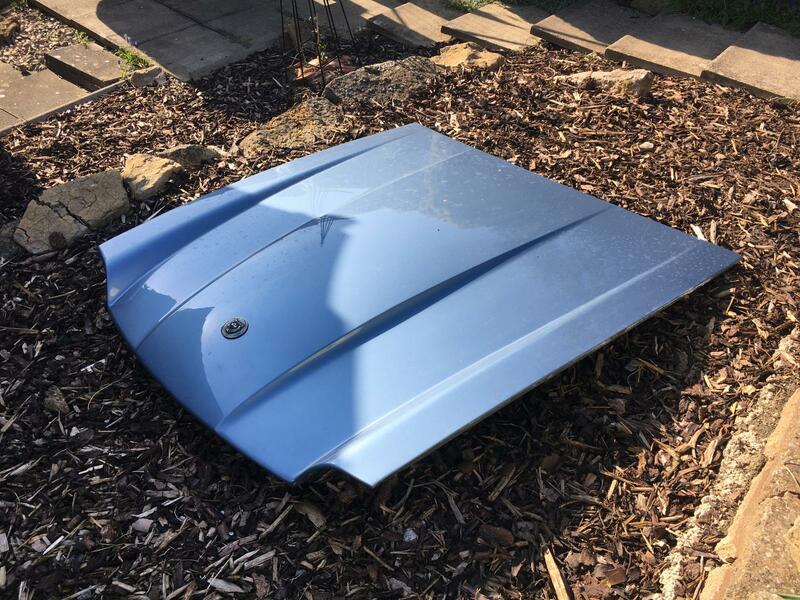 At £200 for the respray including the bonnet, it’s fantastic value. Argos reduced a machine polisher I had my eye on from £50 to £33 so that has been reserved. This weekend will be busy trying to make yet more progress. Still on the hunt for a steering wheel. 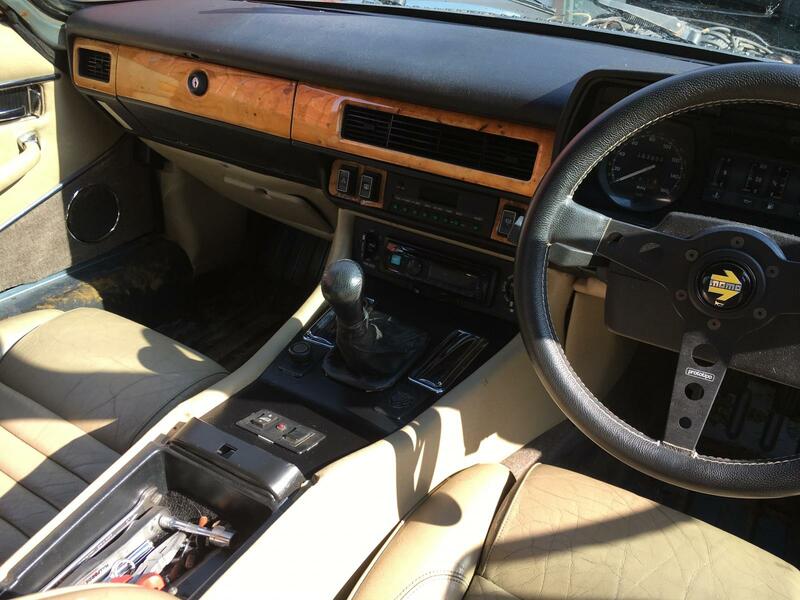 One from an XJ40 will do, as long as it has the horn buttons on the wheel. That is lovely. Swop 4 Locost M9? The engine bay was a bit grubby so off with the bonnet and a basic clean was performed. I'm firmly of the belief you should never hose down an engine bay so it was only a gently clean. I don't like it spivved up anyway. Nice to see plenty of solid metal in all the right places. 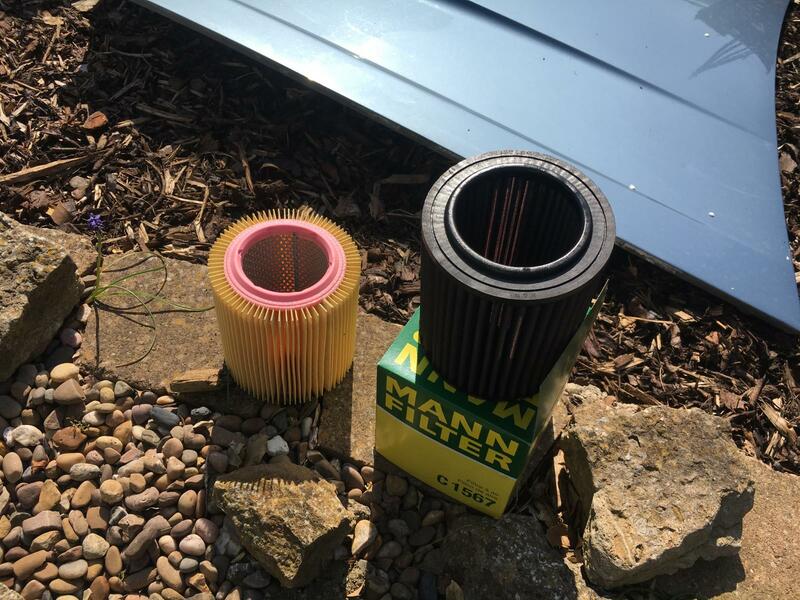 I've taken the K&N air filter out in favour of a regular MANN paper unit. I don't like those oily filters contaminating the MAF. The exhaust heat shield is letting the side down pretty bad. I've got a good spare so that will go on. The exhaust manifolds are free of cracks which is very good news. 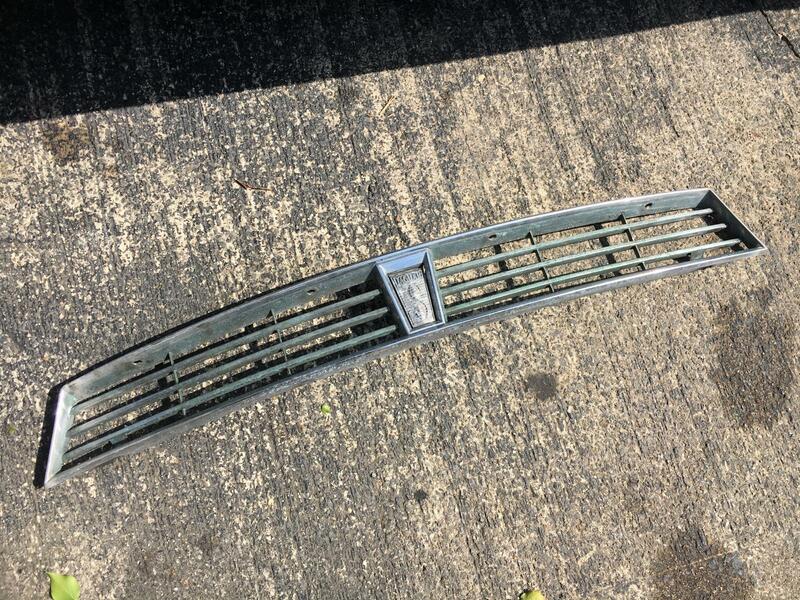 The front grille with get polished up. On the interior front I had a little experiment with the ski slope centre thing. The veneer was gone. I wanted to try a pre-HE look on there instead of wood so opted to have a go with matt black paint. I think it looks better actually. While there the window switches got cleaned up so they work properly now. Windows slide up and down well, not sticking. I'm not sure what the deal with the cruise control is. The master switch on the ski splope (it should say speed control on it) isn't there, just a Jag growler badge. The wiring seems to be there. Maybe they just leave the switch off if you didn't opt to have it and left everything else there. The odd graunching I keep mentioning being the engine fan catching slightly under certain conditions has been sorted. The only rattles now seem to be two catch cans behind the front wheels for rain water. These need securing down somehow. Hot video action of the car on the road. At the very end you can see just how willing it is to rev. It's a bit of a brute. Stunning car, always like to read up on the updates ! Fear not, you can get it down from there. The fuel economy thingy accidentally got reset before that video. Over the drive you see there it did 10 MPG where we were ragging it. Overall though it's very fugal for what it is. I think 35 MPG is achievable. The owners book quotes a mighty 37 MPG extra urban.